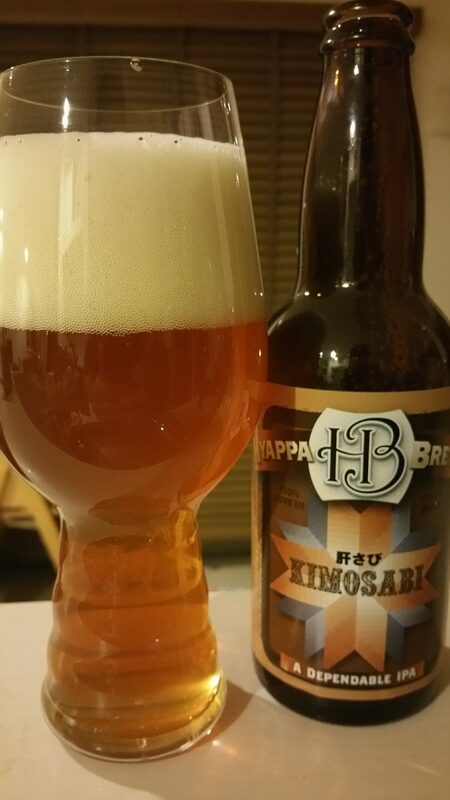 Hyappa Kimosabi IPA is a 6.5% English IPA from Hyappa Brews based in Aichi, Japan. It’s part of their all-year round range and can be found both in bottles and on tap as well. Not much is known about the beer, besides the hop addition changing throughout the year. This version was brewed with Warrior hops – I think as the scrawl on the back of the bottle was barely legible. Hyappa Kimosabi IPA poured out a deep golden copper colour with a decent frothy white head on top, that lasted for a while before collapsing in on itself quite slowly. It had a malt forward aroma, with caramel being the most detectable aroma here. There was a fresh hit of citrus on the nose – perhaps a tad young or freshly bottled. The body wasn’t too dissimilar to the nose with Hyappa Kimosabi IPA being a malt forward beer – more of an English IPA than an American, so don’t be surprised when the caramel flavours kick in first. There was some bitterness from the hops though the malts did slightly overpower the hops in the end. Some citrus flavours came through as well. It finished off with more of a caramel aftertaste with a slight punctuation of citrus coming through in the end. Overall, drinkable and dependable. Hyappa Kinosabi IPA is a dependable English IPA – it isn’t going to blow your taste buds away, nor destroy them. I haven’t come across Hyappa Kimosabi IPA yet online but I picked this bottle up from Le Petit L’Ouest in Shimokitazawa.